Police said Thursday they are investigating the possibility of a third suspect who has been implicated in a fraud and forgery case over a mining deal, for which a Cambodian businessman and a Chinese associate are already awaiting trial. The Phnom Penh Municipal Court has charged the Cambodian chairman of a local conglomerate and a Chinese business associate with fraud and using forged public documents, officials said Wednesday. Cambodian officials have come to the end of a yearlong training program led by foreign officials on how to combat financial crimes amid concerns from the international community that the country is vulnerable to money launderers and financers of terrorism. A Buddhist monk was ordered to leave one of Phnom Penh’s largest pagodas on Monday after he attended the pro-opposition rally earlier that day, monastic officials confirmed Tuesday. The U.K.’s fraud office plans to request the extradition of a British national currently detained in Cambodia, after it brought charges against four people for their part in a $36 million Ponzi scheme involving a biofuel plantation. The Bar Association of Cambodia should consider stricter standards on admission to the bar, make lawyers take regular mandatory training and set up a new disciplinary committee in order to ensure that Cambodia’s legal professionals are independent, the International Commission of Jurists has said. Venturing into Cambodia’s casino market in May 2011, Macau-backed gambling firm Entertainment Gaming Asia promised tens of thousands of dollars to the wife of Pailin’s provincial governor in order to lease land for the construction of a new casino, documents filed with the U.S. financial regulator show. A government spokesman on Thursday welcomed remarks of support for the ruling CPP from China’s foreign minister, saying they showed Cambodia’s main benefactor was an example to other foreign states. Police are looking for the people responsible for creating and posting online an audio clip in which Prime Minister Hun Sen appeared to admit his party had lost last month’s national election, an official said Wednesday. Chinese Minister of Foreign Affairs Wang Yi on Wednesday endorsed the CPP’s claim of victory in the July 28 national election, following talks with both Prime Minister Hun Sen and Foreign Minister Hor Namhong in Phnom Penh, officials said. The U.S. tax collection agency is this week training Cambodian bank staff as well as anti-corruption officials, police, judges and prosecutors in how to investigate financial activity to detect wrongdoing, officials said Monday. Russian businessman Sergei Polonsky, who left Cambodia in April despite being on bail over an alleged assault in December, has returned to the country, according to Russian state media and two associates. Research commissioned by U.S. software firm Microsoft found that more than 96 percent of retailers selling personal computers in Cambodia offer customers unlicensed products, according to a statement from the company. The U.S. Department of Justice and the country’s financial regulator have informed Australia-based mining giant BHP Billiton it could still be charged over allegations the company bribed overseas officials, which include claims of improper payments to members of the Cambodian government. Cambodia has delayed two of its military cooperation programs with Australia, the Australian Defense Department said Thursday, after it emerged this week that U.S.-backed programs had also been postponed after the election. The government on Wednesday insisted that its decision to postpone U.S.-backed military assistance programs following the July 28 election would not have a negative impact on relations between the two countries. 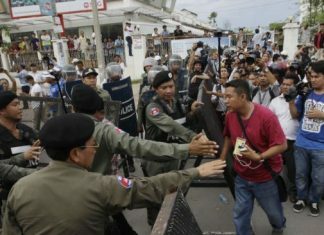 Cambodia postponed U.S.-backed military assistance programs immediately after the July 28 national election, officials of both countries confirmed Tuesday, in a move that analysts said reflects a strain in relations after years of strengthening military ties. Official results released by the National Election Committee on Monday suggest that some provinces came down to only hundreds of votes in the July 28 national election. Deputy Prime Minister Sok An met with the top U.S. diplomat in Cambodia on Friday to discuss the formation of the country’s National Assembly following the disputed July 28 election. U.S.-listed firm Entertainment Gaming Asia’s Dreamworld casino in Pailin province has seen revenue drop by almost 18 percent this year, according to financial results released by the company.